Amethyst is a powerhouse stone. It vibrates at a high frequency, creating a bubble of spiritual protection against negative energy. It awakens higher consciousness, assists in wise decision making free of emotional confusion, and facilitates meditation and intuition. 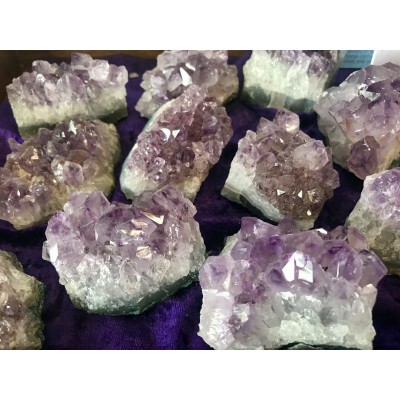 Amethyst has healing powers to help with physical ailments, emotional issues, and in Energy Healing and Chakra balancing. 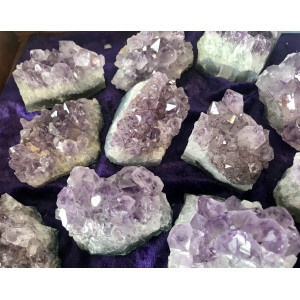 Amethyst crystal therapies are primarily associated with physical ailments of the nervous system, the curing of nightmares and insomnia, and balancing the crown chakra. Brazilian Amethyst is a form of quartz. The presence of manganese in clear Quartz produces Amethyst, while additional amounts of iron vary the purple coloration. These are beautiful pieces in natural form. Average size is 2"-3"